Roblin et al. in 1945 observed that an inclusion of 8-azaguanine in the bacterial medium inhibited the growth of Escherichia coli. Addition of guanine to the medium reversed this inhibition. In 1949 Kidder and Dewey confirmed these findings when the analog inhibited multiplication of Tetrahymena geleii. 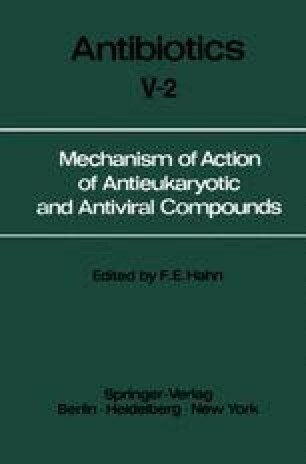 Subsequently, several investigators proved 8-azaguanine to be an inhibitor of the chick embryo (Younger et al., 1950), the Lucerne mosaic virus (Matthews, 1952), the Psittacosis virus (Morgan, 1952), human glioblastomas (Peterson and Murray, 1953), and tobacco mosaic virus (Matthews, 1954). Inhibition of growth of some transplanted mouse tumors was also shown (Kidder et al., 1949). The analog was effective against a variety of murine carcinomas and certain leukemias (Burchenal et al., 1949). It was possible to reverse the inhibition in several of these by simultaneous addition of guanine (Law, 1950; Kidder et al., 1951). Hirschberg et al. (1952) found that antimetaboliteresistant tumors had high azaguanine deaminase activity, while the activity in the susceptible tumors was low or negligible. The 8-azaguanine was enzymatically deaminated to 8-azaxanthine, which had no carcinostatic activity. Interference with this deamination led to a potentiation of the toxic and carcinostatic actions of the analog. Despite exhaustive research, however, no useful role has been found for 8-azaguanine in cancer chemotherapy.